For other uses, see Vesta. Vestas Wind Systems A/S is a Danish manufacturer, seller, installer, and servicer of wind turbines founded in 1945. The company operates manufacturing plants in Denmark, Germany, India, Italy, Romania, the United Kingdom, Spain, Sweden, Norway, Australia, China, and the United States, and employs more than 24,400 people globally. Vestas factory entrance in Pueblo, Colorado. As of 2013, it is the largest wind turbine company in the world. Vestas traces its roots to 1898 when Hand Smith Hansen bought a blacksmith shop in Lem [da], West Jutland which operated as a family business. After the second world war Vestas was founded in 1945 by his son Peder Hansen as "Vestjysk Stålteknik A/S" (West-Jutlandish steel technology). The company initially manufactured household appliances, moving its focus to agricultural equipment in 1950, intercoolers in 1956, and hydraulic cranes in 1968. 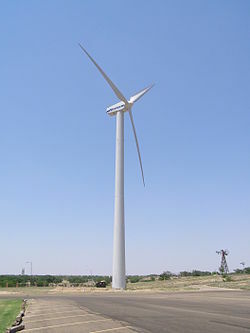 It entered the wind turbine industry in 1979, and produced wind turbines exclusively from 1989. In 1997, the company placed in production the NTK 1500/60. The product was designed by Timothy Jacob Jensen and received the German IF Award and the Red Dot Award. The company's North American headquarters was relocated in 2002 from Palm Springs, California to Portland, Oregon. Vestas began a whistleblower program in 2007, among the first in Denmark. On 1 December 2008 Vestas announced plans to expand its North American headquarters in Portland through construction of a 600,000-square-foot (56,000 m2) new building, but this plan was mothballed in 2009 due to the economic recession, and in August 2010 the company announced a revised plan, scaled back in size, to expand its Portland headquarters by renovating an existing-but-vacant 172,000 sq ft (16,000 m2) building. At that time, Vestas employed about 400 in Portland and committed to add at least 100 more employees there within five years; the new building will have space for up to 600 workers. The company moved its Portland offices to the new headquarters building, a renovated historic building, in May 2012. In February 2009, the company announced the production of two new turbine types, the 3-megawatt V112 and 1.8-megawatt V100. The new models were to be available in 2010. In July 2009, Vestas announced its manufacturing operations on the Isle of Wight in England would close due to a lack of UK demand, affecting 525 jobs there and 100 in Southampton. Approximately 25 workers at the wind turbine factory on the island occupied the administration offices in protest on 20 July 2009, demanding nationalisation to save their jobs. In August 2009 Vestas hired more than 5,000 extra workers for its new factories in China, the United States, and Spain. The company said it was "expanding heavily in China and the US because these markets were growing the fastest, in contrast to the sluggish pace of wind farm development in the UK". As part of this gradual shift in production away from Europe and towards China and the US, in October 2010, the company announced it was closing five factories in Denmark and Sweden, with the loss of 3,000 jobs. In November 2010, Vestas shut down the 70-person staff advisory department 'Vestas Excellence', responsible for securing competitiveness, handling suppliers, quality assurance and globalization. In January 2012, the company suggested firing 1,600 out of its 3,000 U.S. workers if the U.S. did not renew the 2.2 cents-per-kilowatt-hour Production Tax Credit, which was extended in 2013. On 13 August 2012, an estimated 90 workers were laid off from the Pueblo facility. Six long colored lines, leading to an exit, had been placed on the floor. Those laid off were given one of six different colored papers, and then instructed to follow the colored line that matched the colored paper they had been given. In 2013, the tower factory in Pueblo began ramping up to full utilization as orders rebounded from the 2012 slump. Other facilities in Colorado include a further 750 persons employed at a blade manufacturing facility in Windsor, Colorado.[when?] Vestas has nacelle and blade manufacturing facilities in Brighton, Colorado and also operates a tower facility in Pueblo, Colorado. Vestas said it decided to build its North American production facilities in Colorado because of the state’s central location, extensive transportation infrastructure and rail system, existing manufacturing base, and skilled workforce. In May 2013, Marika Fredriksson became the company's new Executive Vice President and Chief Financial Officer after her predecessor Dag Andresen resigned for personal reasons. Her strategy is to lead Vestas back to higher earnings after the important losses faced by the company: from €166 million losses in 2011 and increasing to €963 million in 2012. In September 2013, Vestas made a joint venture for offshore wind turbines with Mitsubishi Heavy Industries, including the 7-9 MW Vestas V164, the most powerful turbine on Earth. In October 2013 Vestas sold its four casting and two machining factories to VTC Partners GmbH. In May 2014, Vestas announced it would be adding hundreds of jobs to its Colorado Windsor and Brighton facilities and following a rough 2012 it called 2013 one of Vestas’s "best years ever". Vestas also added employees in Pueblo and expected the tower facility to eventually top 500. Vestas stated that it expected to have 2800 employees in Colorado by the end of 2014. As of 2016[update], Vestas has a US nacelle production capacity of 2.6 GW. In March 2015, Vestas announced it would be upping jobs by 400 at its blade manufacturing facility in Windsor and stated "We had a very successful 2014". In 2015 almost half of all Vestas turbines were going to the American market (nearly 3 GW for US out of 7.5 GW worldwide). Vestas intends to build a blade factory in India in 2016. In 2014 and 2015, 26 dishonest employees were detected with the company's whistleblower program (the first in Denmark), and disciplined. In February 2016, Vestas got its largest order of 1,000 MW (278 x 3.6 MW) for the Fosen project near Trondheim in Norway. It costs DKK 11 billion, and should deliver 3.4 TWh per year. In 1Q 2016, the average wind turbine price was 0.83 million Euro per MW, compared to 0.91 a year before. In 2016, Vestas was voted number 7 on the Clean200 list. Vestas spent €92 million ($128 million), or 1.4% of revenue, on research and development in 2009. It has filed 787 wind turbine patents (227 in 2010) according to United Kingdom Intellectual Property Office (UK-IPO), while General Electric has 666 and Siemens Wind Power has 242. In October 2009, Vestas and QinetiQ claimed a successful test of a stealth wind turbine blade mitigating radar reflection problems for aviation. In December 2010 Vestas were developing the V164 7 MW offshore turbine, with a 164 m rotor diameter. Prototypes of it will be manufactured at Lindø (the former Maersk shipyard) due to size, crane and port access requirements. Series production of nacelles for the 32 turbines (256 MW) extension of the 90 MW Burbo Bank Offshore Wind Farm will occur at Lindø, while blades are made at Vestas' Isle of Wight facilities in England. DONG Energy will test a prototype in the sea off Frederikshavn in 2013, at a cost of DKK 240 million. A V164 was installed for testing in Østerild Wind Turbine Test Field in 2014. In June 2011, the Vestas supercomputer Firestorm was number 53 on the TOP500-list of the world's most powerful computers calculating worldwide weather in a 3x3 km grid, and it delivers daily weather reports to the newspaper Ekstra Bladet and similar purposes. In 2012, Vestas donated the older 1344-core supercomputer from 2008 to Aalborg University. In October 2011, Vestas participated in the deployment of a floating wind turbine offshore of Portugal. Vestas supplied a v80 2.0 MW offshore turbine to Windplus, S.A. (a joint-venture company including Energias de Portugal, Repsol, Principle Power, A. Silva Matos, Inovcapital and Portugal Ventures). The system, known as the WindFloat, consists of a semi-submersible type floating foundation, a conventional catenary mooring, and the wind turbine. The successful deployment represents the first offshore multi-megawatt wind turbine to be installed without the use of any heavy-lift or specialized offshore construction equipment. In 2012, Vestas scaled back and closed some of its R&D offices in Houston, Marlborough, Louisville, China, Singapore and Denmark. In August 2013, Vestas started operating its 20 MW test bench for nacelles in Aarhus. On 5 September 2013, Dr. Chris Spruce, Vestas Senior Product Engineer, served as member of the Scientific Advisory Board (SAB) for the kite-energy-systems project ERC HIGHWIND, a project at KU Leuven dedicated to the research and development of tethered airfoils dedicated to generating energy by airborne wind energy (AWE). In April 2016, Vestas installed a 900 kW quadrotor test wind turbine at Risø, made from 4 recycled 225 kW V29 turbines. Three months of testing have so far confirmed theoretical models. Vestas has no immediate plans of commercializing the prototype. As of 2019 Vestas has installed over 66,000 wind turbines for a capacity of 100 GW in over 80 countries on five continents. As of 9 January 2019 the company has built production facilities in more than 12 countries, among them China, Spain and the United States.Vestas employs 24,400 people. ^ a b c d e "Annual Report 2015" (PDF). Vestas. Retrieved 8 March 2016. ^ a b c Goska Romanowicz (21 March 2007). "Profits soar for top wind turbine maker". Edie.net. Faversham House Group Ltd. Retrieved 22 January 2009. ^ "Små 1000 nye Vestas-ansatte i 1. kvartal". EnergiWatch. Retrieved 16 June 2016. ^ www.vestas.com, Vestas -. "Profile". www.vestas.com. Retrieved 21 January 2016. ^ "From 1971-1986: Energy experiments and the brink of disaster". Vestas. Retrieved 30 August 2014. ^ a b Beattie, David (22 December 2010). "Key Players in the Wind Energy: Pausing for Thought". Renewable Energy World. ^ "Product Design". Jacob Jensen Design studio. ^ Read, Richard (8 September 2009). "Vestas looking at existing buildings for headquarters". The Oregonian. Retrieved 31 August 2010. ^ Read, Richard; Manning, Jeff (18 August 2010). "Oregon, Portland help wind turbine maker Vestas build $66 million HQ". The Oregonian. Retrieved 31 August 2010. ^ Reddall, Braden. Vestas will not chase market share at any price Reuters/BTM Consult, 1 September 2010. Retrieved 30 December 2010. ^ Acher, John. Vestas kept No. 1 spot in wind market -consultant Reuters/MAKE, 17 March 2010. Retrieved 30 December 2010. ^ a b "26 medarbejdere i Vestas afsløret i svindel". Ingeniøren. Retrieved 20 April 2016. ^ a b Siemers, Erik (18 August 2010). "Vestas keeps HQ in Portland, moving to the Pearl". Portland Business Journal. Retrieved 31 August 2010. ^ Williams, Christina (23 May 2012). "Gallery: Inside Vestas' new digs". Sustainable Business Oregon. Retrieved 8 August 2012. ^ Matthew Weaver and Steven Morris (21 July 2009). "Staff occupy Isle of Wight wind turbine plant in protest against closure". The Guardian. Retrieved 21 July 2009. ^ "Vestas expands wind turbine manufacturing in China and US as British demand collapses". Guardian. 18 August 2009. ^ Stage, Mie. Vestas fires 70 experts Archived 19 October 2012 at the Wayback Machine (in Danish) Ing.dk, 17 November 2010. Retrieved 18 November 2010. ^ Sulugiuc, Gelu (25 January 2012). "Vestas Jobs Threat Pressures Obama to Extend Tax Break". Bloomberg Businessweek. Retrieved 22 August 2012. ^ Severance, Ryan (14 August 2012). "Vestas employees told one by one of layoffs". Pueblo Chieftain. Retrieved 22 August 2012. ^ a b Darrow, Dennis (11 March 2014). "Vestas to hire 80 more for Pueblo tower factory". Chieftain.com. Archived from the original on 17 May 2016. Retrieved 2 April 2015. ^ Jaffe, Mark (21 February 2013). "Vestas cuts 110 Colorado jobs at Brighton, Windsor blade factories". Denverpost.com. Retrieved 2 April 2015. ^ "Vestas and MHI Establish Strong Offshore Wind Partnership" OffshoreWind.biz, 30 September 2013. Accessed: 30 September 2013. ^ Ben Backwell. "Full speed ahead for Vestas/MHI" ReCharge News, 27 September 2013. Accessed: 30 September 2013. ^ "Analyst: Mitsubishi increases Vestas' chance of success" (in Danish) Børsen, 30 September 2013. Accessed: 30 September 2013. ^ Udell, Erin (20 May 2014). "Vestas to add hundreds of jobs in Windsor and Brighton". Coloradoan.com. Retrieved 2 April 2015. ^ Garcia, Adrian (19 July 2014). "Vestas to fill 800 jobs in Colorado by the end of 2014". Coloradoan.com. Retrieved 2 April 2015. ^ Ros Davidson (29 July 2016). "How Vestas won the Midwest". Windpower Monthly. Retrieved 1 August 2016. ^ "Vestas upping jobs by 400 in Windsor". www.bizjournals.com/denver/. 13 March 2015. Retrieved 2 April 2015. ^ Stenvei, Michael (6 November 2015). "Danmark er på vej til at blive lillebror i Vestas-forretningen". finans.dk. 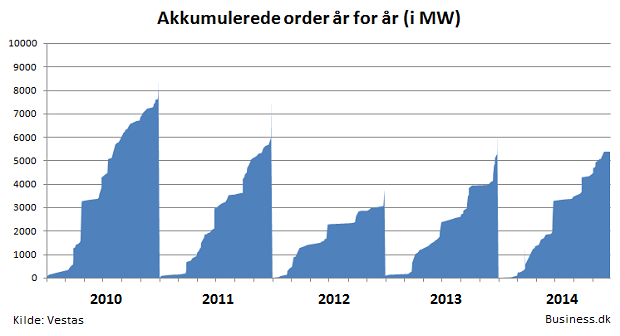 ^ "Her solgte Vestas flest vindmøller i 2015". Jern & Maskinindustrien. ^ "Buoyant Vestas Plans EUR 50 Million Blade Factory in India". 5 November 2015. ^ Nilsen, Jannicke (23 February 2016). "Norge får Europas største vindkraftanlegg: Derfor snudde Statkraft". Tu.no. ^ "Vestas CFO: Prisbilledet overraskende stabilt". EnergiWatch. 29 April 2016. Archived from the original on 16 June 2016. Retrieved 16 June 2016. ^ "Toyota, Tesla and Vestas ranked among world's top green companies". The Guardian. UK. 15 August 2016. Retrieved 5 September 2016. ^ Rosen, Ellen. Intellectual Property Bloomberg, 11 October 2010. Retrieved 11 October 2010. ^ 'Stealth' wind turbine blade may end radar problem Reuters. Cnet, 27 January 2010. Retrieved 22 September 2010. ^ Bredsdorff, Magnus. "Nu indleder Vestas serieproduktion af verdens største havmølle" Ingeniøren, 22 December 2014. Retrieved: 24 December 2014. ^ Nymark, Jakob Skouboe og Jens (22 December 2014). "Nu starter Vestas produktion af gigantisk havvindmølle". borsen.dk. ^ "Ørsted.com - Love your home". orsted.com. ^ Dyrskjøt, Mette. Vestas builds turbines at Lindø Archived 26 November 2011 at the Wayback Machine Børsen, 24 November 2011. Retrieved 10 December 2011. ^ Nymark, Jens Seaturbines competitive in 15 years Archived 19 December 2011 at the Wayback Machine Børsen, 15 November 2011. Retrieved 10 December 2011. ^ Vestas/DONG tests 7 MW turbine fushi, 27 October 2011. Retrieved 10 December 2011. ^ "V164-8.0 MW - Østerild (onshore) - 4C Offshore". ^ List of Top 500 systems, 1–100 June 2011, TOP500. Retrieved 19 June 2012. ^ Kildebogaard, Jesper. "Danmarks hurtigste supercomputer leverer vejrudsigt til Ekstra Bladet" Ingeniøren / Version2, 24 April 2012. Retrieved 20 September 2012. ^ Jesper Kildebogaard. "Vestas' supercomputer finder den bedste bakketop til vindmøllen på 5 minutter" Ingeniøren / Version2, 1 November 2013. Accessed: 2 November 2013. ^ Kildebogaard, Jesper. "Vestas forærer aflagt supercomputer til Aalborg Universitet" Ingeniøren / Version2, 20 September 2012. Retrieved 20 September 2012. ^ Dvorak, Paul (2 November 2012). "Sad sign of the times: Vestas closing R&D facilities". Wind Power Engineering. Retrieved 12 September 2013. ^ "Vestas Begins Operating Wind Industry’s Largest Test Bench" CleanTechnica, 20 August 2013. Accessed: 30 September 2013. ^ "Scientific Advisory Board meeting introduction. 5 September 2013, meeting date" (PDF). ^ "EXCLUSIVE: Vestas tests four-rotor concept turbine". Windpower Monthly. Archived from the original on 28 February 2017. Retrieved 20 April 2016. ^ "Ser du hva som er annerledes med denne vindturbinen?". SYSLA. Retrieved 21 August 2016. ^ Wind as a modern energy source: the Vestas view. (PDF). Wikimedia Commons has media related to Vestas Wind Systems.